In my seedling CC6247 are buds and fast open flowers. Here is a picture of the leaves and a more open flower. The flowers look attractive, much different to the flowers of Confusa. The 4 sepals (tepals?) hang apart divided near the top - Confusa flowers recurve slightly at the tips. Also this plant has a lot of purple in the stems and seems to have it in the sepals (although this may be emphasised by the camera and the light). It would be interesting to see the stamens and how far they hang down. Are they yellow? I have some CC6247 and they have the purple colouring in stem and leaf but mine have not produced any flower buds this year. I have 10 seedlings of 6247, they are still small so would not expect them to flower until next year. Something to look forward to. Here I have a picture of the inside of the flower. This tepal colour is absolutely exquisite. I must lead a sheltered life , I have not yet come across the CC 6247 range of seeds , I would appreciate information of where I can purchase same or if you or any one has any for surplus seeds I would be pleased to purchase them , I havea fascination in germinating new varieties . And the colour interests me also . I have sent a mail to you. I have several plants and 2 with flowers. I am interested in the leaf arrangement on your plants, my young plants only have ternate leaves all alternate on the leaf stalks. I would expect this to change next year, it would apear that the leaf formation on your plant is more like C. connata pseudo-connata, can you confirm? Have you sent pictures to Chris Chadwell? It may be worthwhile sending pictures to Chris Grey Wilson, Roy Lancaster and Brian Mathew. I have been in touch with Chris earlier about locations of plants, unfortunately he did not collect this one, so only knows that it was from Nepal. If you like I could send pictures to these people who may be able to help with identification. Have you tried the plants outside yet? My plants were outsude during the summer but have been brought into the cold greenhouse for the winter. I have spare plants if you would like one, but no spare seed. I get my seed from a Clematis seed share from Chris Chadwell. Thanks for your offer , but I have already had a kind offer of a plant from Ton . I would how ever like to have contact details of Chris Chadwell and the seed share . For those interested; Chris Chadwell, offers a Clematis seed share, for which I get a number of seed packets in a year, this will vary according to the number of collections in that year. The amount paid lasts for about two or three years and is based on the number of packets supplied. This helps fund his expeditions. In the few years that I have been subscribing I have had seed from Tibet, Northern India and Nepal. 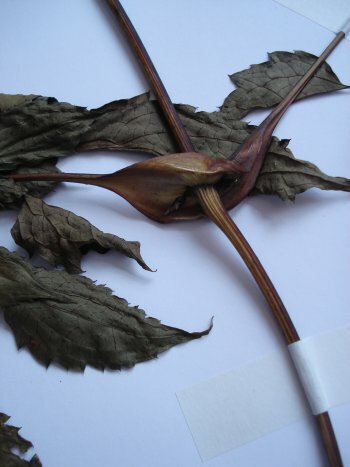 The seed just comes with a collection number and a brief description of the altitude and the area of collection, but some seed is collected by Til Jung, this seed may not be clearly defined as to where it was collected. Most of the seed is viable and the plants from it are identifiable, but there are some plants that after a few years of growing them I am still not sure what they are. If interested it is best to write to Chris Chadwell, at 81 Parlaunt Road, Slough, Berks, SL3 8BE. Thanks Roy and Aidan ,for the information , I will contact Chris and see from there. I would have had some interesting plants by now . In those days I would not have even thought of growing Clematis , I was still in my late teens or early twenties , those where the days ??? Any way thanks again. I have sent the plant to you. 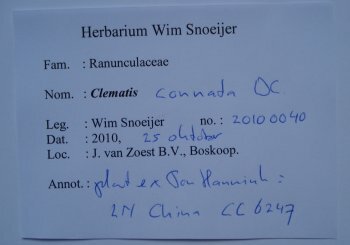 received the plant thank you so much , I have mailed you , have you received it. Excellent plant thanks again . I have not had the mail. CC6679 is showing similar stem/leaf joints as the above , I will have to ask if the seeds are from the same plant . Now I have my plant outside but I place the plant in the greenhouse. I also see buds. My CC6192 was planted outside and flowered from 25.11.09 producing a solitary flower which lasted several weeks. It did not survive the winter, nor did my C. aff Confusa from Crug Farm (though I have a cutting from it). However, I have a CC6163 planted outside which did survive the winter and has some flower buds developing. I also have some CC6247s in containers as well as the C.aff confusa cutting which is now a huge plant. They all have lots of flower buds developing. In my humble opinion the CC6247, CC6192 and CC6163 all appear to be very similar and could be sub species of C Confusa rather than products of natural variation. The CC6163 that did survive the winter is planted in a higher south facing aspect of the garden in quite free draining soil so that is a clue for maximising survival chances. Strangely I did lose several mature CC6247s from a virus that killed them off and I have noticed they are all prone to unexplained die back in some of the stems. If your plant has developed a strong root system it might survive outside particularly if you live in the south, but I would put a good mulch on it and wrap the container and plant in horticultural fleece. I am going to keep one of mine in the green house but the others are going to take their chances in large containers outside (but I will wrap them in fleece). Basically the weather in the Khumbu/Makalu region of Nepal where these plants originate has hot wet summers and cold dry winters so you need to duplicate the cold dry winter if you can. Thank you the notes on your experience with the CC6247 , Mine is at the moment in a large container and has put In a lot of growth this year , and is showing a large number of buds , which I hope will open before the frost get to it , in the Midlands I get a lot more frost damage than I did when I lived in Leeds. Ton who was kind enough to let me have one of his . I have since had seeds from Chris Chadwell , these are CC6677, CC6678 , which I have a number of plants , and CC6679 which only one has survived , the growth of which is a bit like CC6247 in that it has flat leaf to stem joints , only time will tell . Ton as you have seen tells me he put his in the greenhouse in winter , the size of my plant is not going to do my back any good . of clematis , two I think grew just outside HQ offices , but at that age I just thought clematis was just another flower , if only I had collected the seeds . Well thanks again for your information and experience with this range of clematis , and hope you have no losses this winter . to get it in the lean to greenhouse. Still an interesting Clematis without a name! Ron, I did not collect the seeds! 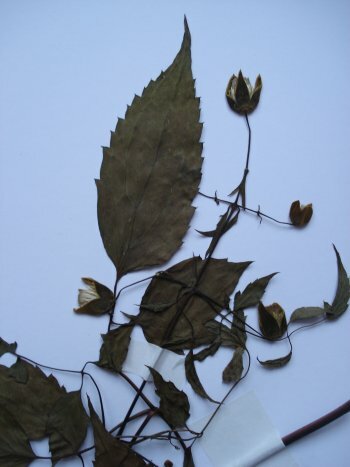 All herbarium specimens I collected this year are already in Leiden but the last ones I collected at the end of October, including Clematis brachiata see previous postings, are still with me. 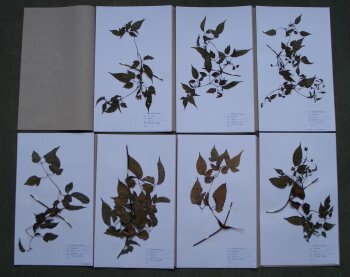 This includes your Clematis connata CC6247 of which I made 7 herbarium specimens from one cut branch. I just took a few pictures this morning and I will post a few. 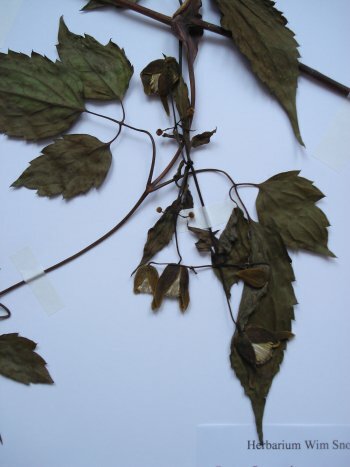 Of course I hope the plant survive this hard winter, the plant is outside in the clematis collection, but this herbarium will last till eternity any way. no previous experience of the plant CC 6427 , I would be glad of any help . all my other plants seem to have some frost damage but are alive . This plant dies sometimes suddenly is my experience. Today I have seen that I have still a plant but I could not see if the plant is alive. If the plant is alive then you can get it. CC 6677 and CC6678 growing , I hope they are more resistant to the cold . My experience was the same as Ton's with these Connata type clematis. Most of mine died suddenly without any apparent reason. I have 3 plants that are definitely still alive, 2 are in my greenhouse and are very healthy, one is under a car port. The one under the car port seemed to die last year but has produced a healthy green shoot from the base. I have one planted in the garden that survived the winter of 2009 but I am waiting to see whether it survived last winter. My experience with it last year is that it is still a bit early for it to show signs of life, but I will keep you updated on its progress or lack of it! I think this group of plants is very sensitive to a number of factors - mainly being soil conditions and wet roots. I say this because I lost quite a few last year around September before the cold weather started but there was still a fair bit of rain. I suspect, but can't say for sure that in the Khumbu/Makalu region of Nepal where they definitely come from, they grow in very free draining conditions where they have hot wet summers but cold dry winters, so in the summer their roots are never too wet. That's my theory anyway. I will ask Chris for some more information on the general soil conditions. I have written an article for the International Clematis Society Journal on some of these clematis, accopanied by some quite good photos I took late last November. From the healthy plants in my greenhouse I also pollinated the flowers which produced some seeds that I have and which I will attempt to germinate.